We have heard your feedback and we are pleased to announce that you can now upload files to Power BI up to 1 GB in size. We also have several more improvements to our RLS and Analyze in Excel previews and a brand new feature: Favorite Dashboards. Read about these and more below. Note: This change does not yet work for Excel workbooks uploaded through the Connect flow. The previous data limit still applies. This applies to you if your Excel files open in an Excel Online experience when you open it from your navigation pane. Learn more about the connect flow in our documentation. The Enterprise Gateway lets you set up SQL Server Analysis Services servers for users inside your company to access. 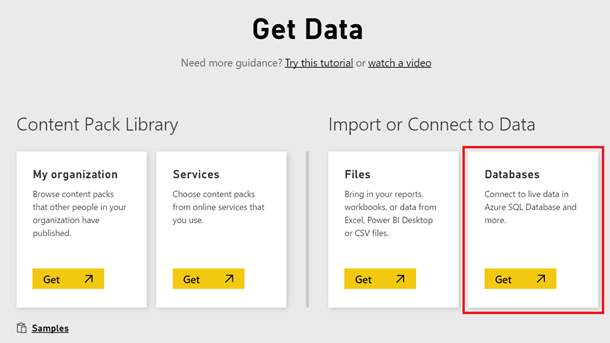 Now when you set up an Enterprise Gateway, users in your company will be able to access these servers in the Power BI service through the Get Data page. To reach your available SSAS servers, start on the Get Data page and select Databases. From there, select SQL Server Analysis Services. Here you will be able to see all your SSAS servers and can select the one you want. We also added support for refreshing datasets that include data from SAP Business Warehouse Server using the gateway and creating UPN mapping rules when you are using Analysis Services with the gateway. You can read more in the Gateways April Update blog. Users can now assign AAD groups (security groups and distribution lists) to a role. This makes it easier to assign roles to a large group of users at once, vastly improving the role assignment process. We’ve heard feedback from users of our RLS preview that you want to test out your rules before sharing out to users, so we adding a feature that lets you test your dataset as a specific role. This will let you make sure the role works as you expect before any users get their hands on your dashboard. 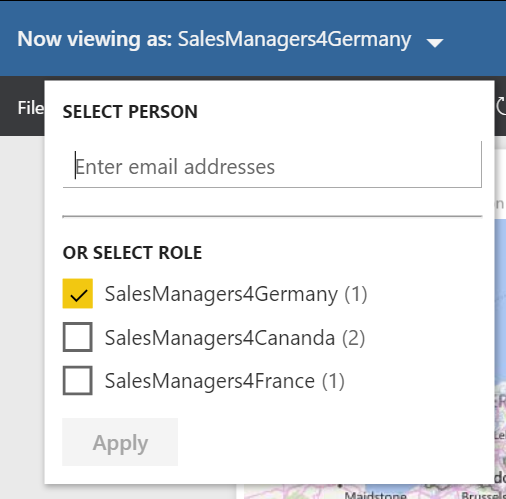 To test out a role, select Test data as role in the contextual menu of a role. This displays a view of your report with that particular role applied. To return to the RLS setup page, in the top navigation select Back to Row-Level Security. You can also change which role you are viewing as or select a specific user you want to impersonate to test your roles. With this, you can have full confidence in the security roles you set up for your data. During this preview time for RLS, we are not only adding new features, but also extending what you can apply RLS rules to. You can now create and apply RLS rules for direct query data sources. 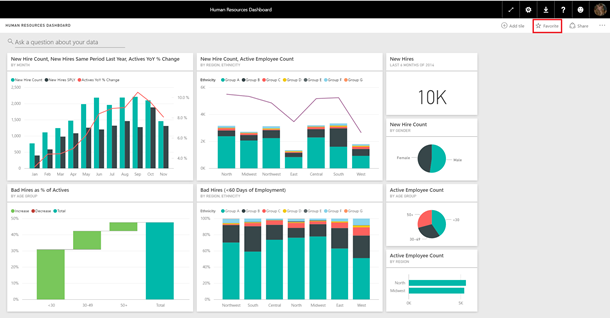 We heard from many users that you want to quickly access a few select dashboards that are most important to you. To help you reach the dashboards you go to most, we added a way to favorite those dashboards and make them easily accessible from all your workspaces. To favorite a dashboard, select Favorite from the top right corner. When you do this, two things will happen. You will get a notification that it was successful, and the button will update to say Unfavorite. Now, if you click this button, it will remove the dashboard from your favorites list. You can find all your favorite dashboards by selecting Favorites in the left navigation. 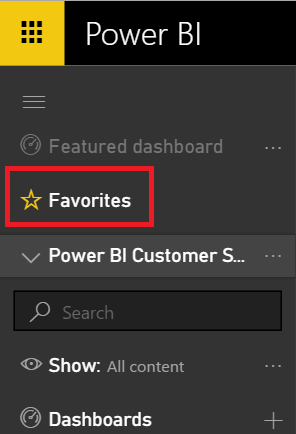 On the Favorites page, you will see a list of all your favorite dashboards. From here you can click on a dashboard to open it, use the share icon to share the dashboard, or use the favorite icon to remove the dashboard from your favorites list. 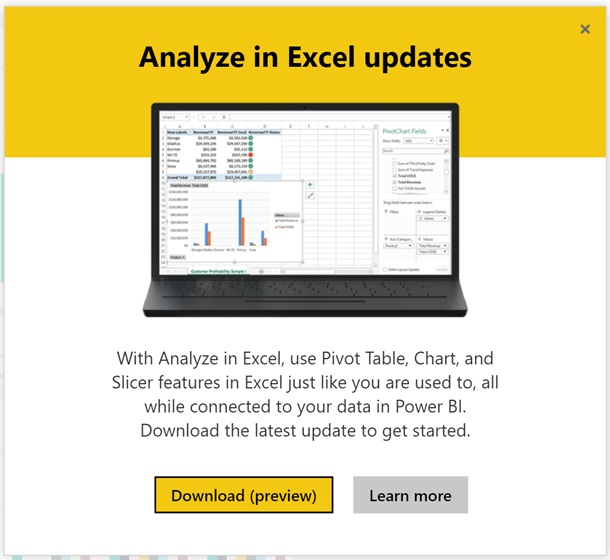 We want to give you the best experience when downloading updates to the Analyze in Excel feature. With that in mind, we updated the experience for reaching those downloads. To get the latest update, select the downloads dropdown and choose Analyze in Excel. From there you will get a dialog that will let you learn more or download the update directly. Once you set up RLS, the rules you apply to the data now flow through when a user analyzes the data in Excel. Now when your audience selects Analyze in Excel, they will only see the data they are allowed to access in the Excel file. Analyze in Excel is not yet available for all data sources and now the experience is much better for data sources we don’t yet support. 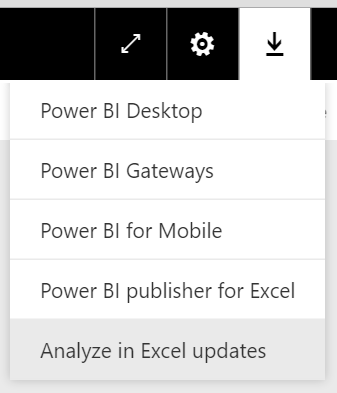 Previously when you selected Analyze in Excel for an unsupported data source, you wouldn't get an error message until after you downloaded the ODC file and try to connect to Power BI, and the error message didn't have much details. Now as soon as you select Analyze in Excel for a data source we don’t support, you’ll see a message letting you know we don’t yet support that data source. We also released some major updates to Q&A including Q&A support for SQL Server 2016 Analysis Services tabular models. Read more on the dedicated blog for the Q&A updates.